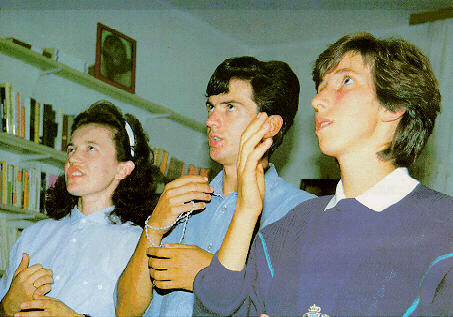 Since June of 1981, in a small village, in the former Yugoslavia, named Medjugorje, the Blessed Virgin Mary has been appearing and giving messages to the world . Our Lady continues to give messages to six young people from the village: Ivan, Jakov, Maarija, Mirjana, Vicka and Ivanka. These six, known as the "visionaries", have had apparitions of the Blessed Virgin Mary. In addition to these messages, Our Lady is to give each of the six visionaries a total of ten "secrets" that will occur on earth in the near future. Only one of the secrets so far has been revealed by the visionaries. When each of the six visionaries has received all ten "secrets", Our Lady will stop appearing to them, then there will be three warnings given to the world. Visionary Mirjana will witness these warnings. After the three warnings, the permanent visible sign will be left on the mountain where Our Lady first appeared. 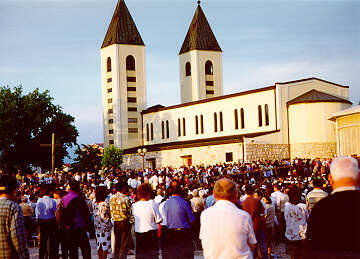 Millions of people of all faiths, from all over the world, have visited Medjugorje and have many stories to relate of miracles, visuals and conversions. Our Lady says: "You have forgotten that with prayer and fasting you can ward off wars, and suspend natural laws". Saint Joseph whose protection is so great, so strong and so prompt, before the throne of God I place all my interest and desires. O Saint Joseph, by your powerful intercession obtain for me from your divine Son all spiritual blessings, Joseph Anthony Tubo through Jesus Christ, Our Lord so that having engaged here below your heavenly power I may offer my thanksgiving and homage to the most loving of Fathers. O Saint Joseph, I never weary contemplating you and Jesus asleep in your arms I dare not approach while he reposes near you heart. Press him in my name and kiss his fine head for me and ask him to return the kiss when I draw my dying breath. St. Joseph , patron of departing souls, pray for us.